Cancer-the sound of the word will cause your life to flip upside down if the doctor uses it! In 2008, I was diagnosed with Hodgkins Lymphoma, and at present I am a post treatment cancer survivor. In 2003, I lost my older brother to Melanoma. As tragic as this sounds for one family, there is good news! We both have won! He is in heaven serving and loving the Lord in ways which are beyond description. On February 11, 2003, at 4:40 a.m., he entered the presence of God while family and friends sang “Amazing Grace” around his bed. He realized more in those next few seconds about God’s love and grace than anyone on earth can imagine. I am still serving Christ through this vale of tears by reaching out to others with the good news of the gospel, and the faithfulness of God through suffering. I do not know how long I will live, but I do know that regardless of when my time to die comes, Jesus is my all in all! Regardless of the outcome of my diagnosis and treatment–cancer doesn’t win! So, we see from the letter of Paul to the Romans, that cancer never wins! Neither does any other malady which torments mankind. Through His death, Jesus dealt a death blow to death and defeated death and disease. This does not mean that going through the valley of suffering with cancer is easy. In fact, it is very hard. The days are long, the sickness is unrelenting and the unknown is tormenting. However, our Lord reaches out to us as we direct our hearts toward him in prayer. He meets us with big hands of grace and pours his love into our lives. He even places us in unique settings to encourage and help others along the journey of suffering. Our families also suffer as they watch us seemingly wither away with nausea and weakness. Christ also gives them strength during their own ‘private hell’ of watching the suffering of those they love so much. For the child of God, cancer is still disconcerting because of all the unknowns it brings into our life. However, because of Jesus’ crucifixion and resurrection, it is Love eternal which awaits us. 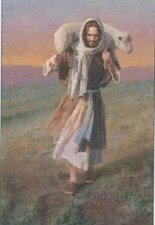 As an ailing sheep, we find the Shepherd everpresent to carry us down this difficult road of suffering. Because of His journey up calvary’s road to the cross, He has experienced the greatest of all pain, and can identify with all our infirmities. (Heb.4:14-15) Whether our journey with cancer ends in death now, or if it ends later from some other ailment or from old age, cancer doesn’t win, Love does!